This fabulous headboard will be perfect in your contemporary bedroom. The headboard is upholstered in a black or white leatherette and has a diamond pattern tufting. 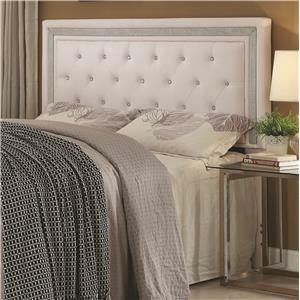 A strip of bling runs along the frame of the headboard and the diamond tufting is pinned by faux crystal buttons. The Andenne Bedroom Glamorous King/ California King Headboard by Coaster at Value City Furniture in the New Jersey, NJ, Staten Island, Hoboken area. Product availability may vary. Contact us for the most current availability on this product. These glamorous headboards will make a statement in your bedroom. Featuring faux crystals and a strip of bling, this fabulous bed is available in either black or white leatherette. The Andenne Bedroom collection is a great option if you are looking for Contemporary furniture in the New Jersey, NJ, Staten Island, Hoboken area. Browse other items in the Andenne Bedroom collection from Value City Furniture in the New Jersey, NJ, Staten Island, Hoboken area.